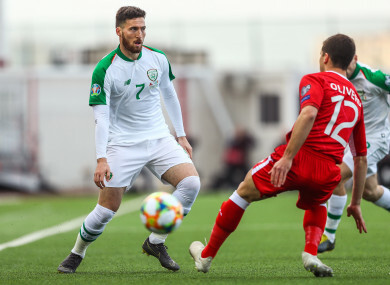 Matt Doherty with Gibraltar's Jayce Olivero. IRISH MANAGER MICK McCarthy admitted his experiment in playing Seamus Coleman and Matt Doherty on the right flank in tonight’s Euro 2020 qualifier didn’t work. Captain Coleman started at right-back while Doherty played as an orthodox right-winger, having spent this season impressing for Wolves as a right-wing back. While he and Coleman linked up neatly during the first-half, Doherty made way for Robbie Brady 11 minutes into the second-half. McCarthy also confirmed that Brady was unfit to start having completed 90 minutes just twice for Burnley all season. “No. It didn’t particularly work well, that. “He’s been the best attacking wing-back in the Premier League to be quite honest, but there’s probably been more room on the pitch. When teams are sitting back, has he got the silky skills to go past people? I’m not sure. “He’s more of a passer and a runner. We did have a little bit of joy down that side in the first-half, but I always thought I might have to put Robbie on. While McCarthy refused to make a mountain of the conditions at the foot of the Rock ahead of the game, afterward he reflected on the plastic pitch and high winds as complicating his side’s job. “It was a horrible game. I’ve not enjoyed one single minute of it. Paying against a team with nothing to lose and everything to gain. “It was a horrible game. Difficult surface, but no excuses, we’ve not played particularly well on it. “I said that to the players before. I said all you can do is you turn up, you win and you get three points. Then you can whinge all you like. Elsewhere, McCarthy said he and the squad were in no way affected by the negative chants regarding now former Chief Executive John Delaney. A banner critical of John Delaney was flown among the Irish fans during the game, and was accompanied by anti-Delaney chants. Then, within 30 minutes of full-time, an FAI statement announced that Delaney was standing down as CEO to assume a new role as the Association’s Executive Vice-President, with responsibility for, among other projects, all matters relating to Fifa and Uefa. “No, when fans told me I’m a wanker or I’m getting sacked in the morning it was annoying”, said McCarthy. “Didn’t realise they knew me that well, to be honest. “Not at all, not in the slightest. Email “McCarthy admits his Matt Doherty experiment didn't work in Gibraltar struggle”. Feedback on “McCarthy admits his Matt Doherty experiment didn't work in Gibraltar struggle”.